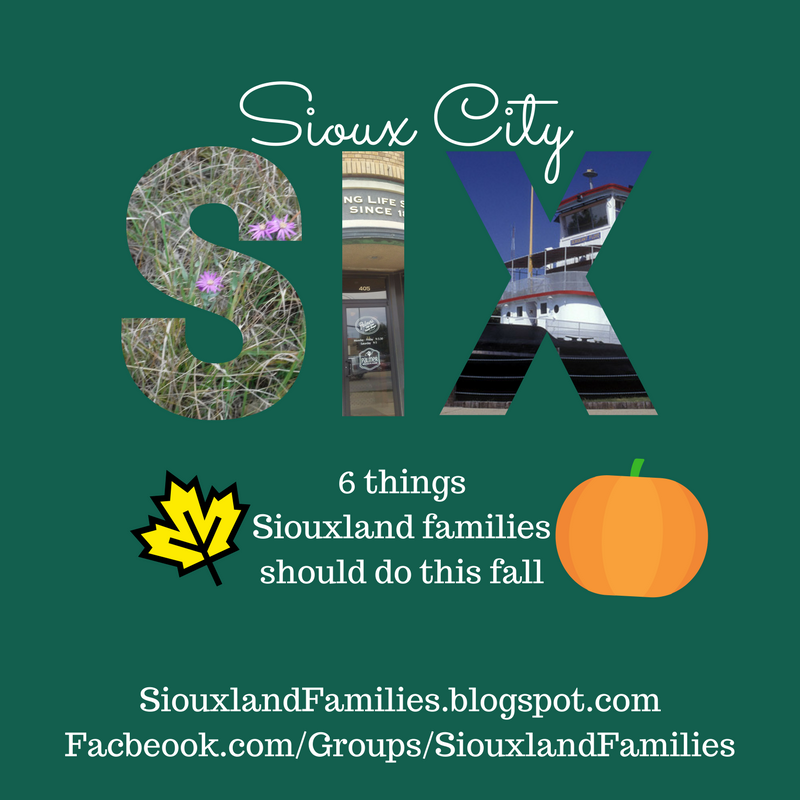 Sioux City Six: 6 Things Siouxland Families will love this fall! Visit a Pumpkin Patch. Check out our list of pumpkin patches within 2 hours of Sioux City for some fun suggestions. Go to the theater or symphony! Fall means the start of the season for symphonies and plays at venues across Siouxland. Some of my top picks for Siouxland Families this fall include Beauty and the Beast at the Sioux City Community Theater and Symphonie Fantastique (Oct 28) and Disney's Fantasia (Nov 18) from the Sioux City Symphony. Hike amidst fall leaves. Some of our favorite places in Siouxland to hike include Stone Park, First Bride's Grave, and Five Ridge Prairie, but I've also heard great things about Ponca State Park, and Danish Alps. Learn about plants and animals in fall at the Dorothy Pecaut Nature Center or Adams Nature Preserve. Both offer fun, free educational programs for all ages, details of which can be found on their websites and in our monthly event posts, and both are also open daily to the public for hiking and playing on their playgrounds. Enjoy fall flavors. Local eateries, chain restaurants, and your own kitchen are all great places to find pumpkin and apple everything! What are you most excited about doing this fall?